In a back-and-forth affair that head coach Aaron Roussell called a “heart stopper,” the Maroons squeaked past #18 UW–Eau Claire by a score of 56–52 in front of hordes of screaming fans in the second round of the NCAA tournament on Saturday. With the win, Chicago advanced to the Sweet Sixteen for the third year in a row, and will play Calvin on Friday for the right to play either St. Thomas or Tufts the following evening. Chicago started off on their back foot, as the Blugolds got off to a quick 8–0 lead, fueled by back-to-back off-balance jumpers from senior guard Nicole Christianson and junior forward Sarah Bingea. A lay-up from fourth-year forward Meghan Herrick five minutes in finally stemmed the bleeding. The early struggles offensively may have had something to do with Eau Claire’s center, 6’5” senior Ellen Plendl, whose height bothered Chicago down low throughout the night. The Maroons regained their composure after the bucket from Meghan Herrick, and four quick points from second-year guard Maggie Ely got Chicago right back in the game, down just two after the 6–0 run. The game then took a familiar turn for Maroon fans as Chicago began to grind UW–Eau Claire down with staunch defense and crisp interior pacing, dragging the shot-blocker Plendl away from the hoop on one side before dishing it across the lane for unguarded lay-ups over shorter defenders. Chicago went into the break with a 10-point advantage, which, given the defense being played on both sides, seemed like a difficult deficit for the Blugolds to make up. The second half began similar to the first, with Chicago playing their usual stifling defense but struggling to score on the other end against an equally suffocating UW–Eau Claire squad. A 9–2 run from the Blugolds, ending five minutes into the second half, brought the lead back to one. Chicago was outscored by a total of 17–4 in the first five minutes of each half. The game then became very interesting, as the teams traded hard-fought buckets. The referees, as is the tendency in post-season play, swallowed their whistles and allowed the teams to play physical, Midwestern style basketball. On one play midway through the second half, Meghan Herrick, a Wisconsin resident herself, drove hard to the hoop and collided with Plendl, who stands nearly six inches taller. Both were sent flying to the floor. UW–Eau Claire knotted the score at 44 with a jumper from Christianson, and Chicago responded with a lay-up from fourth-year All-American Taylor Simpson and a three-point bomb from fourth-year guard Joann Torres, which sent the crowd to its feet. The cheering was so loud that, at times, it became difficult to hear. The Blugolds weren’t done yet. Down five with just three minutes to go, UW–Eau Claire began chipping away at the lead with clutch free throws—two from Christianson and then two from Plendl. Those were only Christianson’s second and third free throws of the entire tournament, and for Plendl, the free throws came on the heels of a 50 percent performance from the line just the day before. Just one possession later, a miscommunication on defense left Plendl open for an easy lay-in, and Chicago found itself in an odd and discomforting spot, down one point with just 1:56 to go. The next trip down the floor, Chicago responded, as UAA Most Valuable Player Morgan Herrick sank one of her high-arching jumpers over the outstretched hands of Plendl while being fouled. With chants of “MVP!” ringing through Ratner, Morgan Herrick calmly sank the free throw, completing the three-point play and giving Chicago a two-point advantage. Two more free throws, one from each of the Herrick sisters, pushed the lead to four. After a quick bucket from UW–Eau Claire, Chicago inbounded the ball to second-year transfer Julie Muguira, who, by sinking both free throws, pushed the lead to four and put the game virtually out of reach. 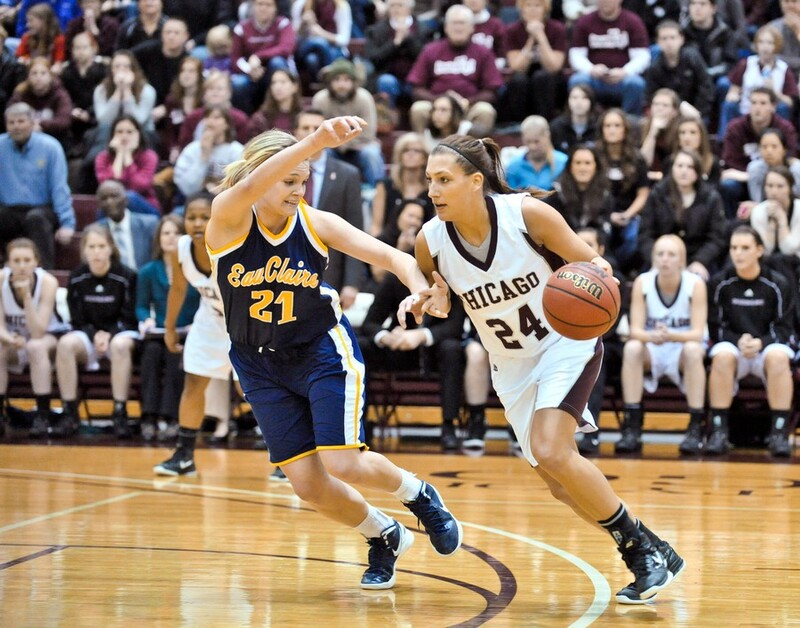 The win gives Chicago enormous momentum heading into the game against Calvin on Friday night. On Sunday, Chicago was awarded home court advantage for the Sweet Sixteen and the Elite Eight, another monumental advantage going into the weekend.